+1 for the Autozone Duralast Gold Ceramic pads. Because of the dust and embarassing squealing with my factory GS pads I changed them out to the Duralast pads. I'm just a street cruiser with my vette, stomping the pedal around town too of course. The pads are pretty decent for my use. Its been a few hundred miles and they are very low dust and quiet too. I paid $88 front and rear + free shipping when they were on sale. Sold my factory pads for $50. Last edited by Cuckoo; 06-19-2017 at 06:40 PM. I'm running them and they work for me. A lot of members are running them. I love them because of the very low dusting and no noise YaY!!!! Glad you like them man. I think Ill be getting a set soon too. The break squeal is driving me nuts. How did the stock pads make it to production is puzzling. I put them on mine when I got my new chrome wheels. Dusting is very low, which is good for me since I show my car regularly. Saves my knees; the stock pads were absolutely horrible with dust and created a constant need for pulling the wheels to clean them before shows. Now a quick wipe-down has the wheels sparkling. 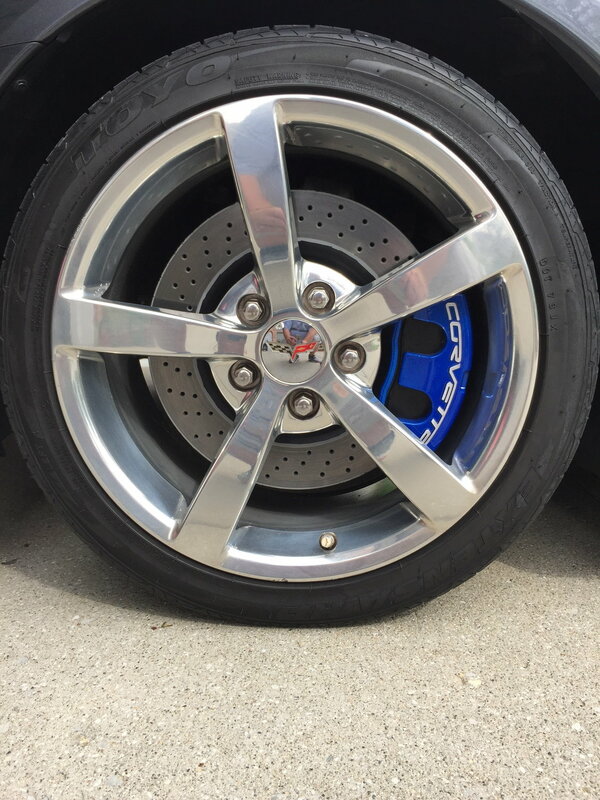 I recently upgraded to the Z51 cross-drilled rotors, powder coated the calipers and changed the brake hoses to the braided stainless steel type. I installed new AC Delco Ceramic pads. The squeal is horrendous. Does anybody have the Z51 rotors that they installed these pads on? I just drive mine on the street without much heavy driving. If I brake heavy, the squeal does go away. I have the Z51 package on my vert. No squealing with the Duralast Gold pads. You can use the same pads as you did before. The Z51 and base caliper is the same. You *may* get a little more dust but that is because of the drilled rotors acting like a cheese grater on your pads. I won't use anything else. No more sequel or brake dust. I recommend them highly. Send a private message to Ronald Koch Jr.
Find More Posts by Ronald Koch Jr.
Wow, I can't imagine anyone wanting to purchase the OEM sinterted metal pads for all the noise and dust. You couldn't pay me to take a set now. 09 Z51 Vert. 16k miles. Break pads squeal like a stuck pig. I`m next. I`ll do them with the tires. Brake dust brutal. Installed the Duralast ceramics yesterday. Pleased with the feel and no noise. Stopping power seems great. Can't wait to see how little dust they create. For less than $100 for both front and rears this seems like an unbeatable deal. Last edited by NashvilleGrandSport; 06-25-2017 at 08:26 PM. I can't believe I waited three years to put ceramics on my '13 GS. The squeal I had with the oem pads you could hear me coming down the block. Now zero noise and zero brake dust. Congrats. I had the grey GS wheels at first that came on the car. But changed the brakes out within the first 2 months and oh my the brake dust was brutal. After then even with the alloys it was a whole lot cleaner on the wheels. I installed the chrome GS wheels now. I couldn't imagine those stock dusters with chrome wheels!!! I'd die. After removing my AC Delco pads that had a few hundred miles on them and replacing with the Duralast Gold, I couldn't be happier. The squeal is gone!!! It is nice rolling up to a stoplight without announcing my arrival. every time my OEM pads squeal, i make sure to get on it hard at the next stoplight. Normally goes away. Maybe its a "warming up" thing?